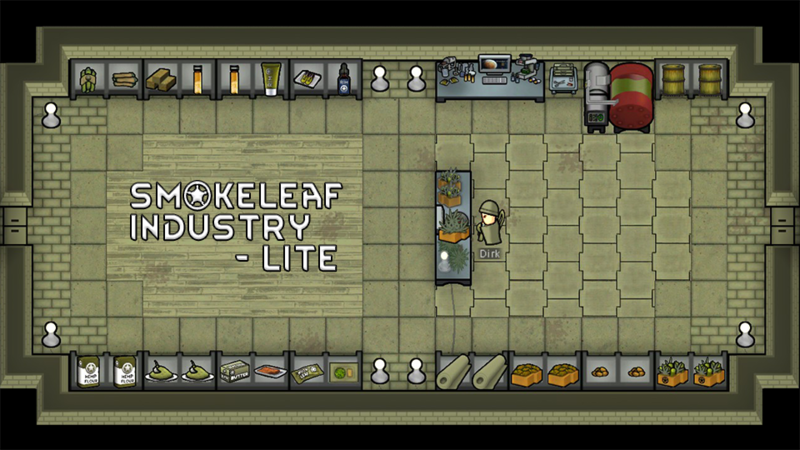 Smokeleaf Industry - Lite is a mod that adds various new drugs, foods, medicines, building materials and more all based around Smokeleaf cultivation and processing. All items added by the mod are based on real world applications of "smokeleaf" and it's byproducts. Medicinal, recreational and industrial uses are all included. Research must be conducted in order to unlock the various items and their uses. This "Lite" Version was made at the request of many people. It includes a lot less than the original mod, but has all the things that I felt were "Smokeleaf Industry". Note: Many aspects of the vanilla smokeleaf joint have been changed. Most importantly, the recipe now requires smokeleaf buds that can be obtained by trimming your plants. Trimming and rolling are unlocked after researching Smokeleaf Cultivation. Smokeleaf Production - New work benches and generator added. Smokeleaf Byproducts - Obtained by processing smokeleaf leaves at a Crafting Spot, Drug Lab, or Cultivation Benchr. Recreational Drugs - Created by processing smokeleaf buds and other drugs at a Crafting Spot, Drug Lab, or Cultivation Bench. Edibles - Cooked/crafted at a Fueled or Electric Stove. Medicines - Crafted at a Medicinals Lab. Other Stuff - Crafted at a Stonecutter's Table, either Tailoring Bench and the Refinery. Unzip the downloaded archive and place the contents in your RimWorld/Mods folder. Then, activate the mod in the mod menu in-game. If you want to install mid-game, make sure you have no bills for making Smokeleaf joints set first. If you have Vegetable Garden Project, remove any hemp fabric you might have first, and then activate SI. Should be ok, but no guarantees and not recommended. To update, delete the Smokeleaf Industry folder in your RimWorld/Mods folder and unzip and place the updated mod in the folder. None, but, if you have any Vegetable Garden mods installed, put Smokeleaf Industry after it. Probably not compatible with any other mods that depend on the vanilla smokeleaf joint recipe. Should be good with everything else. Thanks to dismar for Vegetable Garden. Thanks to Marnador for the awesome font. Thanks to Nightingale for the very useful ModCheck. And, thanks to Tynan for such a great game. Awesome. Hope you like it!